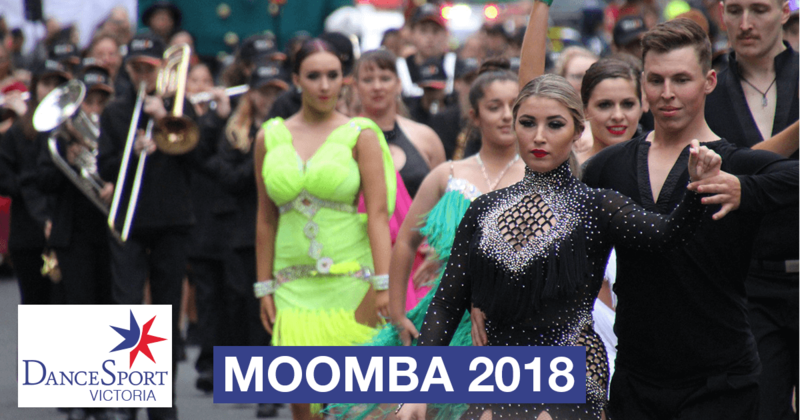 Melbourne's Moomba 2018 was a fantastic event to feature DanceSport. 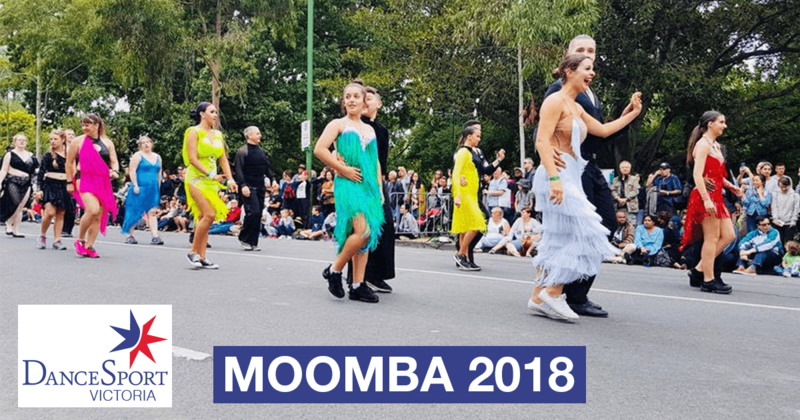 DanceSport was viewed by big crowds at the Moomba parade on Monday 12 March 2018. 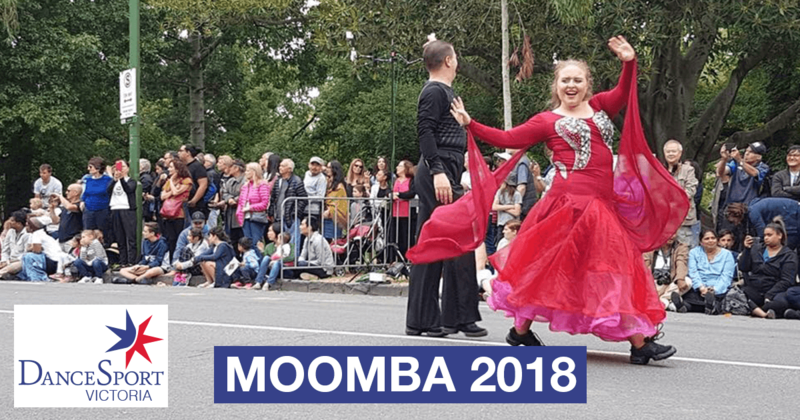 Prior to the parade, the King and Queen of Moomba were welcomed by a showcase performed by our very own Australian Junior champions, Sam Brown and Berkley Wood. Introducing the King and Queen if Moomba with Sam and Berkley , well done guys . Chrissy and Jimmy were great . We were asked to perform for Channel 7’s breakfast show, “Sunrise”. Our wonderful team was ready for filming by 6am! Check out the clip - note there is more after the weather. The annual parade, which now travels along Melbourne’s famous Botanical Gardens, was telecast live by Channel 7. Check out the route. Approximately 50 dancers from all over Victoria represented our sport on Victoria’s Labour Day Weekend (10-12 March). 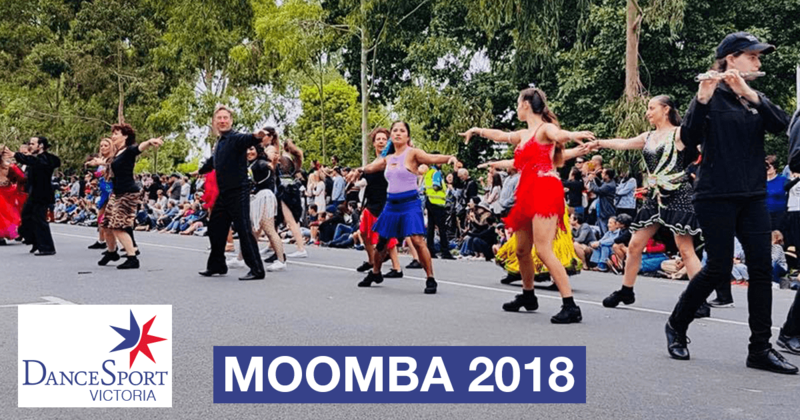 Moomba, Australia’s biggest community festival, stretched for a kilometre – with representations of the state’s culture. The Parade included participation from the Chinese community with dragons, new and vintage emergency service vehicles, and a float carrying the Queen and King of Moomba, Chrissie Swan and Jimmy Giggle. DanceSport seized upon the invitation to promote our sport by including Advanced through to Beginner level dancers. At the last minute, we persuaded the Melba College band – experienced Anzac parade performers – to play for us and they kindly obliged. "We began practising in January", Geoff Vine, Chairman of Marketing Commision DSA, commented. "The training was necessary to nail the routines. As we were such a big group this year – we had to split the training over two different studios and on different days – to cater for our volunteers. The crowd reaction to our routines (Samba, La Bomba and Cha Cha) was sensational. We just couldn’t stop smiling, such was the applause along the Parade. At the end of the morning we were on a high, even if our feet were feeling the pressure of performing on bitumen." Registrations of interest for 2019 will be taken by Geoff Vine later in the year. 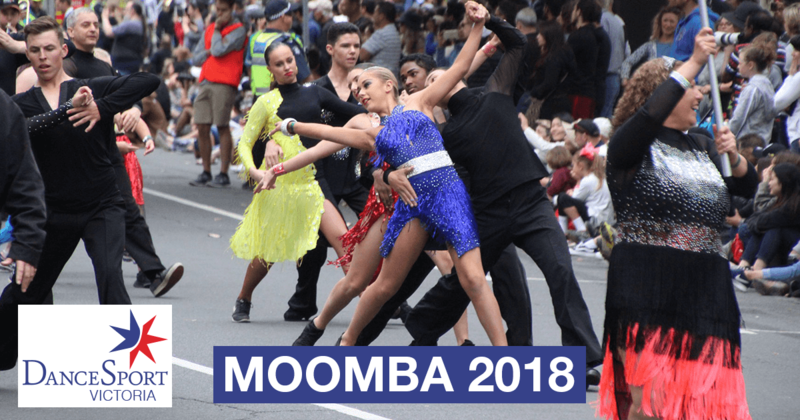 Just visit the DanceSport Moomba website. 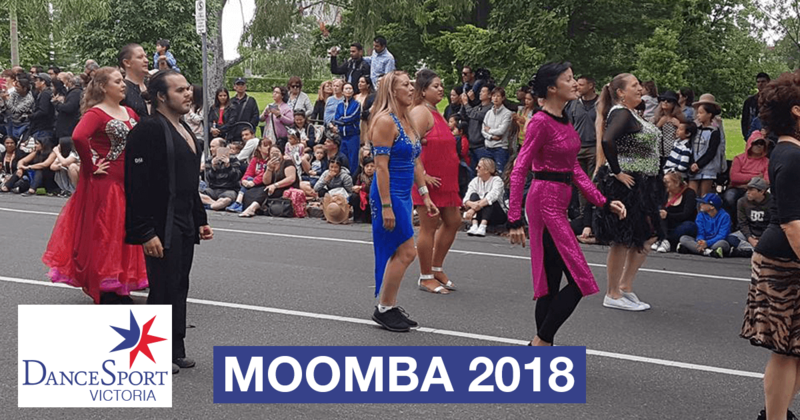 Along with the live telecast of the Parade, Moomba asked DanceSport to put on a three-hour showcase on the afternoon of the parade. Some of our top Victorian couples gave a terrific performance. As part of the showcase, we included a dance lesson for the general public. 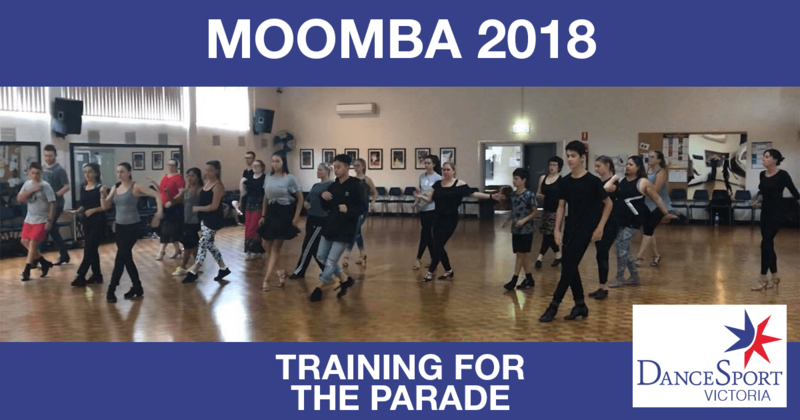 Thank you so much Jenny Kirillova Charles Yanfeng Xu Josh Pickup Indi Sing Yuri Stroungis Jacinda Lee Timmy Cole Francesca Vocisano and Aleksander Hughes for your amazing performances today to help promote DanceSport at the Moomba Festival! So proud of you all!! And a huge shout out to Monique Savill for your help on the mic! You’re a ⭐️!! The coverage reinforces DanceSport’s bid to be included in the 2028 Olympics. DanceSport Victoria thank Geoff Vine and Martyn Kibel for their work in overseeing the overall program; Jarryd Byrne and Meagen Alderton for organising the showcase team, and Antony and Anna Svasek for training the parade team. Big thanks also to Sam Brown and Berkley Wood for being involved in all of it! 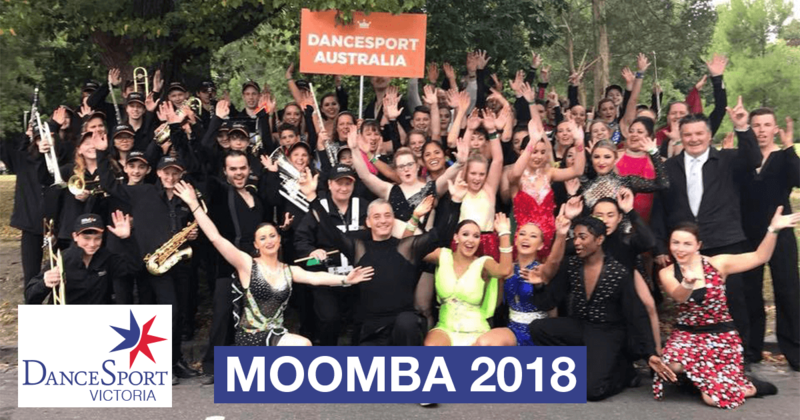 It was big team for DanceSport Victoria at the Moomba Parade 2018!